Sunday UPDATE: The numbers don't lie. Ryan Reynolds is a bigger box office draw than Mark Wahlberg. Now before you go all R.I.P.D. 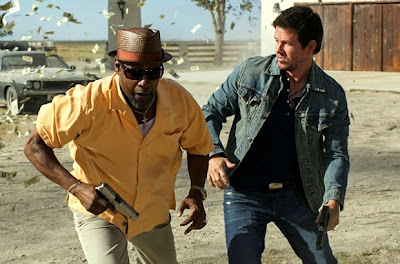 on me, know this: Teamed with Denzel Washington in 2012's Safe House, Reynolds bagged $13M more in his debut frame than Wahlberg managed with Denzel in this weekend's 2 Guns. Yes, it's a bit more complex than that, seeing as the former was released in the beginning of the year, sans the residue of an action onslaught that the latter ran up against. But don't discount the fact that 2 Guns couldn't break the $30M barrier in August, when moviegoing is front and center, even with summer now quickly expiring. Seeking something uninspired? You'll find a double dose of it this weekend at your local multiplex. Hollywood has delivered a pair of newbies better suited for early February than early August: 2 Guns and The Smurfs 2. The former – a bromidic-by-all-accounts buddy-cop flick – will do big business on the backs of its super-duper star leads, while the latter – the second outing for the three-apple-high blue dudes – will sponge off parents' remaining movie cash before their tots head back to classrooms. 2 Guns $37M - There's no more money actor than Denzel Washington. The 58-year-old has opened 10 of his last 11 movies above the $20M mark —11 of 12 come Sunday. The Smurfs 2 $24.5M - How confident is Sony in their Smurfs? A threequel is already in the works. The Wolverine $23M - Hefty drop for the roided-up mutant in his second weekend. The Conjuring $13M - Will creep past the $100M mark Friday night. Despicable Me 2 $10.5M - $600M worldwide and still climbing.